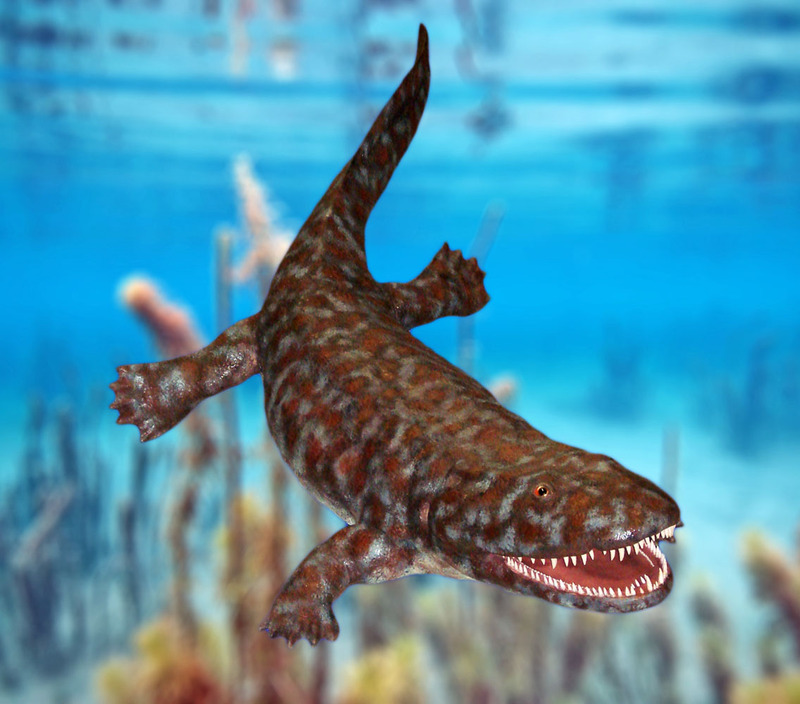 385 million years ago, the first amphibians evolved from fish and set foot on land. But what drove them onto land? And how did they actually learn how to walk? The first amphibians on land, that were also the first animals with a spine on land, evolved from fish with legs. These fish also needed lungs to survive on land and many other adaptations. But what drove these fish to start a life on earth? First of all, most of these fish with legs lived in shallow water. Because of extreme droughts more than 385 million years ago, the shallow water became more and more hostile to the fish; it became saltier and warmer. The fish didn’t like it and fled out of the water, onto the land. Moreover, a lot of bacteria and viruses made the life for the fish in the water even more unpleasant. But the land was also attractive to the fish with legs as there weren’t any competitors, like animals who eat the same food as the fish do, or threats, like animals that have the fish with legs as prey. This was of course because there weren’t many animals on land yet, only a couple of simple, insect-like lifeforms. Swimming and walking are two wholly different ways of moving, however. On top of that, soil close to the shallow water where the fish crawled out of isn’t the easiest to walk on, since it’s usually very muddy and a bit uneven. 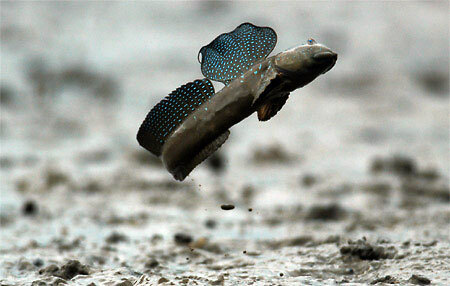 How did the fish pull it off to learn how to walk? That’s exactly the question that Benjamin McInroe and Henry Astley asked themselves. And as it turns out, the tail of these first amphibians was really important. Stephanie Pierce thought that with their tails and forelimbs, the fish-like creatures managed to hop around on the uneven, muddy soil. Much like mudskippers, fish that can also live on land, still do today. Benjamin McInroe and Henry Astley then made a computer simulation of the hopping movement, and they found out that it is indeed possible that these first animals on earth used their tail and arms to move around. We know that these first amphibians didn’t use their hind legs to move around, like salamanders do, because a discovery made by Stephanie Pierce. 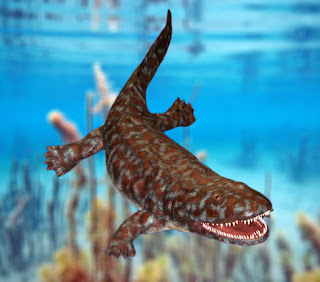 She and her team studied fossils of the extinct Ichthyostega, one of the first animals on land with complete limbs. And they found out that it is very unlikely that this animal used its hind legs to move around. As the Ichthyostega had hind legs that pointed backwards, much like seals have. These legs are excellent for swimming, but useless for walking. So scientists had to come up with another theory about how these first amphibians moved; they hopped. And so, the salamander-like way of moving, with use of the hind legs, evolved at least a bit later. Click here to read more about biology. Where did the butterflies go?